Our School-age Center, which our students call "A Special Place of Our Own," provides a warm, nurturing, safe and fun place for your "I'm too old for a babysitter" school-age child. Our center provides care for children beginning with first grade (6 years) through 12 years and is located one building behind our Preschool Center. Each child receives individual attention to homework needs and has the opportunity to participate in self-directed as well as teacher-directed activities. We pride ourselves on implementing curriculum that builds social skills and supports academic lessons taught in school. For example, we look forward to planting a garden again this year and working together in a gardening club. Last year's garden provided us with many hours of collaborative enjoyment, lessons in science, math, and nutrition, as well as a lot of delicious fresh veggies to eat and share with our families. 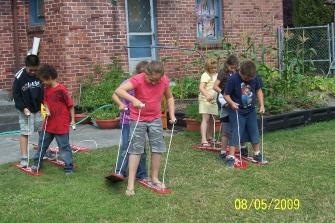 This is just one of the fun learning opportunities available to students at our School-age center.